Anthony Liccione has led a very brave life. His childhood was rough as he was a part a broken family. He is an American poet and author. He has written numerous quotes on life. In his quotes he gave very useful and beautiful messages. He thinks that life is mix of good and bad, pain and happiness. We have to keep moving forward in spite of any hurdles. 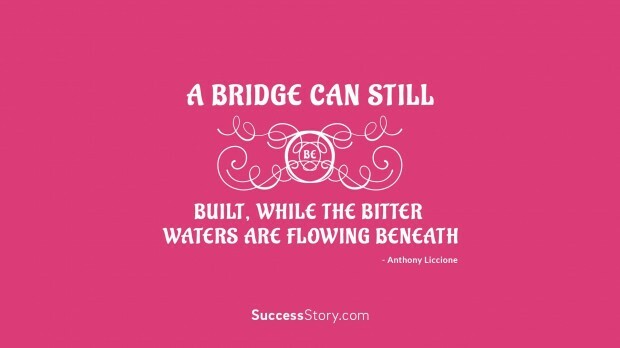 For that he has given a beautiful example of dirty water and bridge in one of his quote. He is born in Chicago, Illinois. Raised in Rochester, New York because of his disturbed family he has to move among family members and various homes. He has also spent many years of his life at his friends, strangers and vacant places. Then finally he stayed in his car too. That was a very tough time of his life but he didn’t let it take toll on him. He completed his education without any of his family support. He used to write his pains and thoughts on the paper. He lost his mother at a very young age and writing used to give him lot of comfort. He met a writer and he motivated him to write poetry. Later with appreciation he took writing as a serious business. He has authored books “Back Words and Forward” and “Please Pass Me the Blood & Butter”. He started with spiritual writing but then moved to inspirational stuffs. His quotes motivate people to keep walking in life in spite of obstacles.